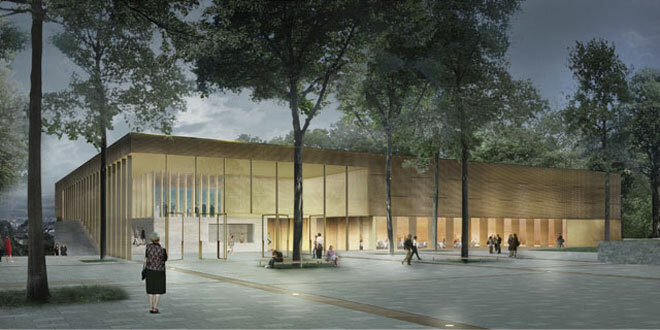 In a selected competition for a multipurpose hall in Iserlohn, Germany SMAQ was awarded with the second prize. The proposed building structures the park site of the Alexanderhöhe in such a way that it formulates together with the existing theatre two squares on different levels. The main spaces of the building – the foyer and the main hall – are conceived as the space between two sculptural stratum – the earth work and a floating brass roof. Besides the main hall the building includes a secondary hall, conference rooms, a multipurpose hall and a shooting club with shooting ranges. The floor area adds up to approximately 4.500 m².